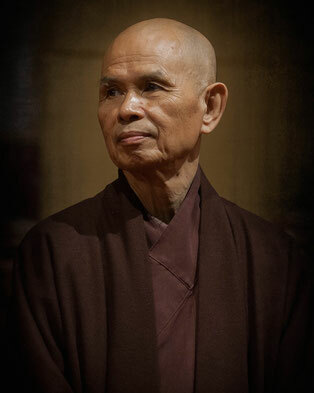 Voor de eerste sangha-avond is gekozen voor een klassieke lezing van Thich Nhat Hanh. Zeker in deze tijden van aanslagen is hij weer actueel. Veroordelen we de daders zonder meer of kunnen we dieper kijken? Veroordelen we presidenten en regeringsleiders als ze een oorlog beginnen? Kunnen we kijken naar onze eigen manier hoe we in het leven staan? Pas als we écht naar onszelf kunnen, willen en durven kijken kunnen we het transformeren. "Many of us are not healthy within, and yet we continue to look for things that only harm us more. We come home from work exhausted, and we do not know how to relax. We feel a kind of vacuum in ourselves, so we turn on the television. We live in a society where we always feel we are lacking something, and we want to fill it. If we don’t turn on the TV, we eat or read or talk on the telephone. We are always trying to fill our void with something. Some people even do social or political work this way. But doing this only makes us less satisfied, hungrier, and we want to consume more. We feel alienated from ourselves. There is so much anger and fear in us, and we want to suppress them, so we consume more and more things that only increase the level of toxicity in us. We watch films filled with screaming and violence. We read magazines and novels filled with hatred and confusion. We do not even have the courage to turn off our TV, because we are afraid to go back to ourselves. Do not feel discouraged. Just by your way of looking at things and doing things, you influence others. The night I heard President Bush give the order to attack Iraq, I could not sleep. I was angry and overwhelmed. The next morning in the middle of my lecture, I suddenly paused and told my friends, “I don’t think I will go to North America this spring.” The words just sprang out. Then I continued the lecture. In the afternoon, one American student told me, “Thay, I think you have to go to the United States. Many friends there feel the same as you, and it would help if you would go and support them.” I did not say anything. I practiced breathing, walking, and sitting, and a few days later, I decided to go. I saw that I was one with the American people, with George Bush, and with Saddam Hussein. I had been angry with President Bush, but after breathing consciously and looking deeply, I saw myself as President Bush. I had not been practicing well enough to change this situation. I saw that Saddam Hussein was not the only person who lit the oil wells in Kuwait. All of us reached out our hands and lit them with him. In our collective consciousness, there are some seeds of nonviolence, and President Bush did begin with sanctions. But we did not support and encourage him enough, so he switched to a more violent way. We cannot blame only him. The President acted the way he did because we acted the way we did. It is because we are not happy enough that we had a war. If we were happier, we would not take refuge in alcohol, drugs, war, and violence. The most important practice for preventing war is to stay in touch with what is refreshing, healing, and joyful inside us and all around us. If we practice walking mindfully, being in touch with the earth, the air, the trees, and ourselves, we can heal ourselves, and our entire society will also be healed. If the whole nation would practice watering seeds of joy and peace and not just seeds of anger and violence, the elements of war in all of us will be transformed. We must prepare ourselves, whether we have one minute, ten years, or one thousand years. If we don’t have time, there is no use in discussing peace, because you cannot practice peace without time. If you have one minute, please use that minute to breathe in and out calmly and plant the seeds of peace and understanding in yourself. If you have ten years, please use the ten years to prevent the next war. If you have one thousand years, please use the time to prevent the destruction of our planet. Transformation is possible, but it takes time. There are already seeds of peace in those we call “hawks,” but they need us to water their seeds of peace and understanding or else their seeds of anger and aggression will continue to dominate them. Do not feel discouraged. Just by your way of looking at things and doing things, you influence others. Approach everyone with love and patience, and try to water the positive seeds in them. We have to help each other, being skillful, kind, and understanding. Blaming and arguing never help. People everywhere saw the Los Angeles policemen beating Rodney King. When I first saw that video on French TV, I felt that I was the one being beaten, and I suffered a lot. I think you must have felt the same. All of us were beaten at the same time. We were all victims of violence, anger, misunderstanding, and the lack of respect for our human dignity. But as I looked more deeply, I saw that the policemen beating Rodney King were no different from myself. They were doing it because our society is filled with hatred and violence. Everything is like a bomb ready to explode, and we are all a part of that bomb; we are all co- responsible. We are all the policemen and the victim. In the practice of mindfulness, we nurture the ability to see deeply into the nature of things and people, and the fruit is insight, understanding, and love. Because we have not practiced deeply enough, violence has become the substance of our society. Putting the policemen in jail will not solve this fundamental problem. We accept violence as a way of life and as a way to deal with problems. If we are not mindful—if we do not transform our shared suffering through compassion and deep understanding—then one day our child will be the one who is beaten, or the one doing the beating. It is very much our affair. We have to look at the roots of the problem and not just on the surface." From “Love in Action, Writings on Nonviolent Social Change,” published by Parallax Press. © 1993 by Thich Nhat Hanh.